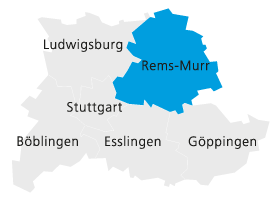 The Stuttgart Region is one of Europe's strongest economic locations and a leading high-tech location that boasts a first-class research and education infrastructure. Its special strengths lie in the fields of automobile construction and mechanical engineering, in the creative sector and in IT with a focus on industry-related services. The roughly 160,000 companies here owe their strength to high tech, innovations and excellently trained skilled specialists. It is not just multi-national corporations like Daimler, Porsche, Bosch, IBM and Hewlett Packard that have their global or German headquarters here. The region is characterised by a mix of global players and exceptionally innovative SMEs with a strong quality ethos. The employees in these family-owned small and medium-sized businesses have above-average expertise and identify more than average with their employer. Another feature of the economy in this region is its exporting strength, with regional industry recording more than half its earnings abroad. Skilled specialists in technical, scientific and other knowledge-based areas find excellent professional opportunities in the region. We have put together information that is relevant for you if you want to work and live in the Stuttgart Region. If you do not find what you are looking for, the Stuttgart Welcome Center will be happy to help you over the phone, by e-mail or - from the autumn of 2014 - in person.